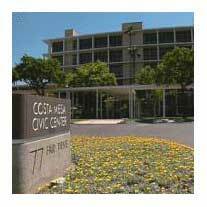 As o f early Thursday afternoon the Costa Mesa City Clerk reports that, so far, seven residents have pulled papers to run for the two seats on the Costa Mesa City Council in November. Some of those names will be very familiar to you and a couple will raise question marks. Since the period for pulling papers ends the first week of August there is still time for more candidates to throw their hats into the ring. WENDY'S RUNNING AGAIN The list below is random, except I gave Wendy Leece first position because she is the only incumbent running. Leece is ending her first four year term following her election back in 2006, when she rode Allan Mansoor's coattails to victory. She didn't really run her own campaign - her campaign web site never did get up and running and seldom was she seen on the campaign without the shadow of Mansoor on her shoulder. RIGGY - ONE MORE TIME Carpetbagging Planning Commission Chairman Jim Righeimer, amidst much hoopla and with a crowd of more than two dozen well-wishers cheering him on, pulled papers this week and held a "news conference" - with no members of the media present - on the steps of City Hall. There's a short video clip floating around out there of the event, but it's of such poor quality that I didn't bother to provide it. Here's a photo of Riggy and his entourage that morning. See how many elected and appointed officials you can identify. Here's a hint - there are three council members, four planning commissioners, one parks and recreation commissioner and one water district director. Lo cal businessman, author and former candidate Chris Bunyan is back. Bunyan has been devoting a great deal of time on the Banning Ranch issue and I suspect that will be part of his campaign platform. High school math teacher Chris McEvoy is also back again. McEvoy, true to his promise following the last election, has remained immersed in municipal issues and has been a regular presence before the City Council and commissions. He has consistently presented his views respectfully and with clarity and certainly has a better feel for how things work - or don't work - in our city than he did two years ago. Yet another "Ch ris" is running this year - lawyer Chris Blank has decided to take his considerable legal and organizational skills into this campaign. His presence in this campaign will add a very different dynamic to the process. Newcomer to Costa Mesa, Susan Lester, didn't let a ny "grass" grow under her feet and has pulled papers. Lester has been a frequent speaker before the council recently, with her primary focus being on the sale of medical marijuana in our city. Her name appears in a closed session agenda item involving a lawsuit between the City and several proponents of the distribution of medical marijuana. She's relatively unknown in our town and it's going to be very interesting to see what the thrust of her campaign will be. Finally, someone named Jeffrey C hapman has pulled papers for this campaign. We will find out more about him once he returns the package to the City Clerk, but for now he's just a big question mark. This promises to be a very interesting campaign - as the past several have been in our city. We'll find out if Leece can actually mount an effective campaign on her own. Of greater interest to me will be the campaign Righeimer mounts this time around. The last time he ran he finished 4th. 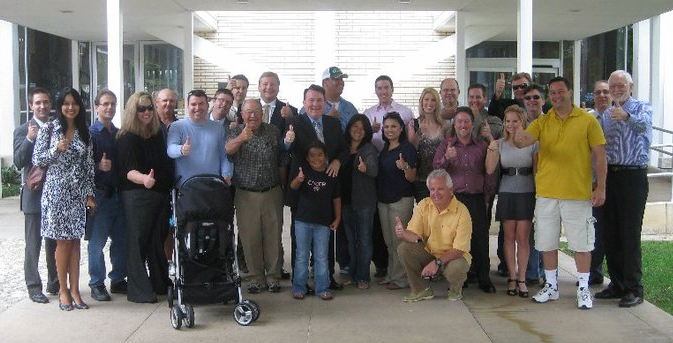 Riggy is "one of the boys" in the Orange County Republican Party - he's in very tight with the Chairman, Scott Baugh. You don't get any more "connected" than Riggy is, so we can expect a lot of support from the OC GOP for his campaign. I'll be very surprised if he doesn't end up out-spending every other candidate very significantly this summer and fall. Those who read this blog frequently know that I'm not a big Riggy fan. I didn't - and still don't - like the way he blew into town here during Allan Mansoor's re-election cam paign almost four years ago to the day and then ended up elbowing his way onto the Planning Commission just a few months later with an application filed well after the deadline - shoving aside Mansoor loyalist Paul Bunney in the process. I've said many times, his appointment was pure political payback for the support he and his buddy, Congressman Dana Rohrabacher, provided for Mansoor. 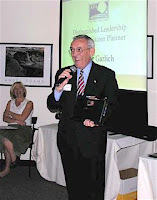 I also don' t like Righeimer's style as Chairman of the Planning Commission. He plays fast and loose with the rules, ignoring established procedures and protocols and has been seen bullying more than one applicant appearing before him. He has a tendency to micro-manage projects coming before the commission, attempting to overlay his own personal agenda instead of following the rules in place at the time. He seems to frequently be trying to re-shape our city into some distorted version of Irvine all by himself. 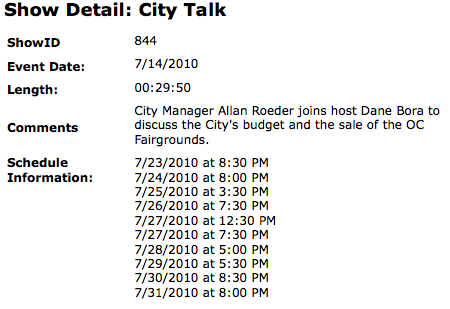 Righeimer's behavior relative to the Fairgrounds Sale issue makes me very distrustful of him. As councilwoman Katrina Foley reported on the dais, he told her that he was ready to "blow up" the deal because he was being blocked from playing a role in the process. I have no reason to doubt Foley since he told me virtually the same thing during an earlier telephone conversation. And , my biggest concern about Jim Righeimer is what appears to be a planned take-over of our municipal government. He's manipulated himself into a powerful commission assignment, where, as chairman, he runs things like a little kingdom. 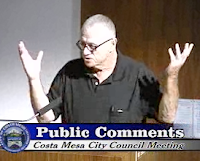 Of even more concern is a report I recently received about him telling a long-time community resident and activist that he no longer had a political future in Costa Mesa and that Righeimer and his cadre of buddies - Steve Mensinger, Colin McCarthy and Jeff Mathews - were all lined up to jump into city council slots as the opportunities presented themselves. In my opinion, it is absolutely no coincidence that Mensinge r has headed the "draft Katrina Foley for School Board" movement this year. If Foley runs for Michael Collier's seat and wins she will have to abandon her council seat with two years left on her term. The new council - the one seated following the November election - will most likely appoint someone to serve out her term. If that council is comprised of Riggy and Leece plus Eric Bever and Gary Monahan I think there will be ZERO chance that they would take the next-highest vote-getter from the election, even though that person will have already been vetted and considered by the voters. Nope, I think they would appoint one of "their boys" from the group mentioned above to get another step up in their take-over. I certainly hope the v oters pay attention this year, and that they take the opportunity to attend any candidate forums presented this summer and fall to personally assess all the candidates. If they don't, and if that results in Riggy's election to our city council...well, they will get what they deserve - a dictatorship. 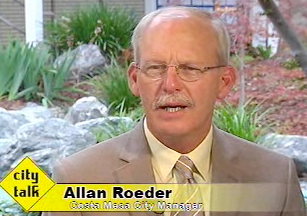 On a much more positive note, City Manager Allan Roeder is featured again on the most recent edition of Costa Mesa TV's City Talk. This time he answers questions by host Dane Bora about the budget and the Fairgrounds Sale. This is an excellent half-hour presentation and should be required viewing by every Costa Mesa resident. You can view the streaming video HERE. The following is the viewing schedule for the remainder of the month on CMTV, Channel 24 on Time Warner Cable and Channel 99 on ATT U-Verse. The Costa Mesa City Council meeting last night went about as expected. Wendy Leece pulled the issue of the loss of two school resource officers from the Consent Calendar for separate discussion. After much discussion and explanation by members of the Police Department, the council voted to approve the Memorandum of Understanding with the School District which eliminates two school resource officers - budget cuts are a pain! 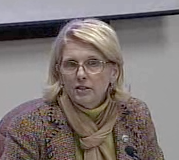 Former mayor Sandra Genis pulled item #7, the results of the June 10, 2 010 election as respects Measure C. Her concern was that some elements of the MOU in place Facilities Management West would supersede Measure C and the current zoning plans for the Fairgrounds site. After some discussion City Manager Allan Roeder affirms that the language in question was a safeguard, not a loophole. Katrina Foley requested that language in the land lease be crafted to further protect from those issues about which Genis expressed concern. A fter some spirited discussion, applicants Judi Berry, Kathleen Eric and Agnes Dubberly were appointed to the Costa Mesa Senior Corporation Board. Board President Bruce Garlich expressed some concern with the application of Judi Berry - that it seemed quite adversarial. I posted that segment of her application in my last entry, and I agree with Garlich. Allan Mansoor recommended Berry - no surprise there, since she's his long, long time supporter and campaign Treasurer. (Wonder if she's sent all that money back to the Facilities Management West donors yet?) 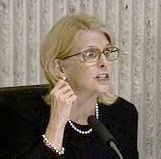 In my opinion, placing Judi Berry on the Senior Center Corporation Board is like turning a fox loose in the hen house. I suspect her presence will not reduce the animosity between the Board and the City, but will exacerbate it. Foley, from the dais, suggested that Garlich and Berry get together and try to find common ground. We'll see how that goes. K athleen Eric may actually be an excellent addition to the board. She has a strong positive senior orientation and has been attending board meetings for some time. Agnes Dubberly brings a very strong background to the board, including extensive experience with non-profits and management background. Perhaps th e most positive segment of the council meeting was the presentation of the public hearing about the Broadway Safe Route To School Grant. This, as Foley stated during the discussion, was a perfect example of what can happen when community members and the city staff collaborate on an issue. Public Services Director Peter Naghavi made an excellent presentation and many residents and officers of the Eastside Neighbors Group spoke in support of the plan. Broadway is the widest residential street in the city and is an almost uninterrupted straight line from Irvine Avenue to Newport Boulevard. I'd have loved to grow up here - Broadway would have made a great drag race street! In any event, the council moved to proceed with this project and use nearly $1,000,000 of federal grant funds to make the improvements that will make that important stretch of roadway safer, slower and more beautiful. Congrats to all involved and especially to Naghavi and his staff for the excellent work done on this project. Perhaps th e most uncomfortable segment was the one dealing with the authorization of placing delinquent fines on the tax rolls for collection. Nearly $25,000 in overdue fines which have exhausted all local collection efforts and appeals require city council approval to turn the fines over to the county for placement on the tax bills. Two residents, with delinquent fines totaling $2,000 and $850 respectively, made impassioned pleas for the council to not place the obligations on the tax rolls. The discussion was frustrating. Eventually, a motion by Foley and seconded by Leece to permit those two to pay a small amount now and the balance within a year, was rejected. Both debts, plus the others for whom nobody spoke, will be placed on the tax rolls and will be due with the first installment of the property tax in November. At the request of Katrina Foley, the council adjourned the meeting in memory of community activist Anne Hogan Shereshevsky, who passed away recently. 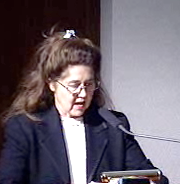 Anne was a fixture in the council chambers and elsewhere, speaking out on many issues near and dear to her heart. 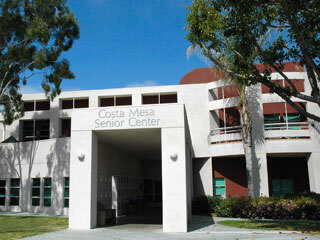 She was very active in the Costa Mesa senior community and frequently addressed the issues important to that group. She was a strong advocate against so-called safe and sane fireworks, and lobbied each year for a community fireworks show instead. 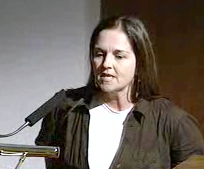 She was direct and articulate, which caused some elected officials some heartburn from time to time. Her contributions to our community will be missed. What I thought might be a fairly short, fairly smooth City Council meeting tonight in Costa Mesa may turn out to be a barn-burner if certain activists have their way. On the Consent Calendar, near the beginn ing of the meeting, in which the council may simply vote all the items as a package, there are a couple that will certainly be pulled for separate discussion and vote. The first, Item 6, is a vote approving the Memorandum of Understanding (MOU) between the Newport-Mesa Unified School District and The City on the reduction of two School Resource Officers - bringing the total down to 2. I suspect there may be some folks that will want to hear the logic of this decision. We'll see..
Then, Item 7, which is a resolution declaring the result of the June 1, 2 010 election... this item will affirm the passage of Measure "C". It's my understanding that members of several groups opposed to the sale of the Orange County Fair and Event Center will be in attendance to request this item be pulled for a separate vote. This one is going to be interesting because it may be alleged that Measure "C" is moot in light of the creation of a Joint Powers Authority to deal with the proposed lessee of the Fairgrounds following the sale. Some activists plan to show up in large numbers and demand an explanation. I wouldn't be surprised to see former mayor Sandra Genis stand and ask questions the council will be hard-pressed to answer. La te in the meeting, under New Business #1, the council will consider appointing up to three new members to the Costa Mesa Senior Center Board. There are five candidates listed in the staff report, all of which seem to bring certain strengths to the board, four from Costa Mesa and one from Newport Beach. You can read their applications and backgrounds HERE. 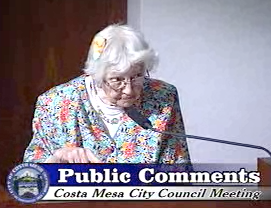 Among the Costa Mesa applicants is the perky Judi Berry, a long-time Westside community activist and strong supporter of Mayor Allan Mansoor - she managed the finances for his campaigns. Her most recent high visibility bit of activism was her crusade, along with her husband, Mike, to restore dog feces collection bags in our local parks. As I've said before, every time I see a pile of dog doo in our parks I'll think of the Berrys. Ms. Berry fancies herself a financial guru and has been omnipresent during budget discussions for the past several years. According to her application, she brings a strong financial management background for our consideration. I don't question Ms. Berry's credentials - but I wonder about her motivation. In response to the question about why she wishes to serve on the Board she begins with this statement: "For several years I have been concerned about the "not so stellar" reputation that the Senior Center has with some of the seniors and others in the community. I believe that this can be changed by having a more sensitive and respectful board. I also believe that the finances of the center should be completely transparent. For example, for several years I made donations to the Senior Center. I stopped making these contributions when I could not get anyone to return my telephone calls. They did not even know what I was calling about, but could not be bothered to return my calls. I believe that this attitude can be changed by having some new people on the board." Now, I don't know how you interpret that statement, but it sure seems to me that she wants a position on the board so she can get even for perceived past rebuffs - not the most noble of motives, for sure. I'm not sure how effective Ms. Berry will be on the board, regardless of her credentials, when her motivation is revenge. Also among the applicant pool for consideration is another long-time Westside activist, Kathleen Eric, who, with her husband Christian, have been involved in many efforts to affect positive change to their part of town. They are part of a cadre of activists who gave us Mansoor, Eric Bever, Wendy Leece and, of course, Chris Steel. Ms. Eric brings a different skill set for consideration than Ms. Berry, but when reading her application is seems clear that they share an anti-management attitude - a general displeasure with the way the Senior Center is managed - and want a seat at the Board table so they can "fix it". It seems to me that, because of their political connections with members of the City Council, both Ms. Berry and Ms. Eric are slam dunks for seats on the board. I find myself wondering if their presence at the table will actually improve the difficulties they perceive or will it only further exacerbate the turmoil caused by the interference of Wendy Leece in the day-to-day operations of the Senior Center over the past couple years and further erode the Center's fund raising capability? Sadly, I suspect the latter.